I got on with extremely well with Mícheál (pronounced MeeHall) the Electrician. My dad was an electrician and in my teens I would help him out on various jobs. So, every now and then, I gave Mícheál the Electrician an extra pair of hands. Nothing too technical, just pulling through cables so he didn’t have to go back and forward between areas and up and down his ladder so many times. 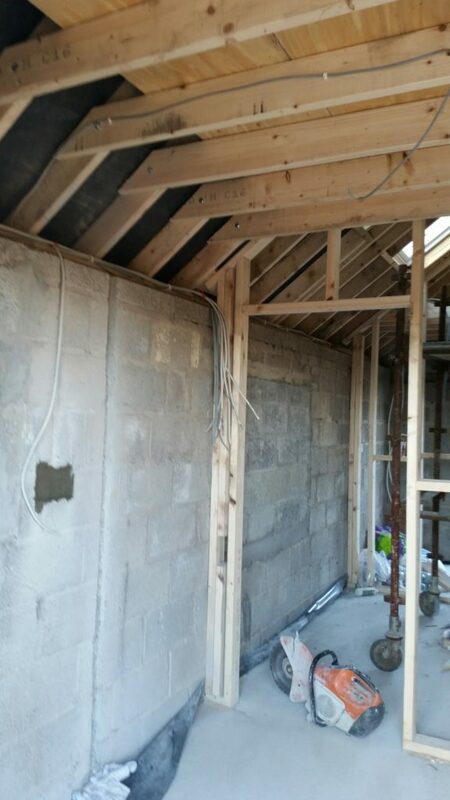 Once the cabling was done, Michael the Carpenter came back on site to fix the plasterboard. This was done incredibly quickly and the place was really taking shape. Kieran the Plasterer arrived to do the “bonding”. 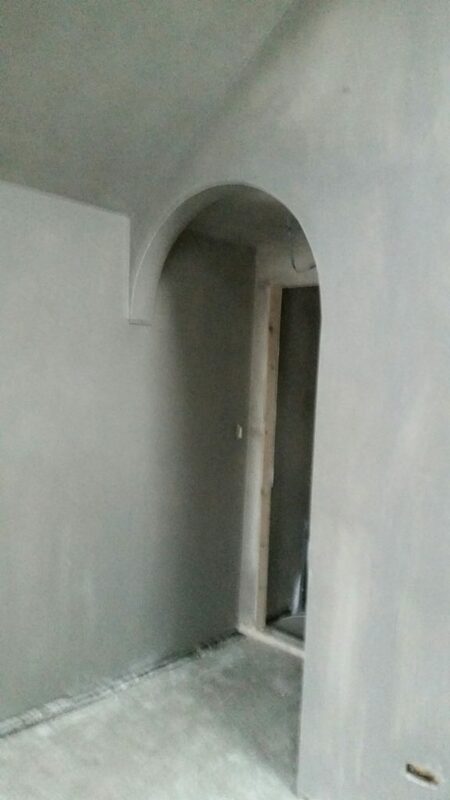 Because of the decision we took on the design of the ceiling, the curved edges had to have extra plaster put on first to create the shape. Other edges, like the archway we wanted going from our meeting room through to the door of the toilet, needed bonding too. Plaster comes as a powder that is added to lots of water and is applied wet. If you have ever used Polyfiller then you’ll know that adding the right amount of water makes it workable. It’s much the same approach with plaster. Key to plaster working is of course the water. After plastering walls and ceilings, the water must be left to evaporate until the plastered surface is dry. Drying plaster is a case of where “moisture really matters”. And that’s where also we had a problem. Being winter it was both cold outside and inside our new building which had no heating. As I describe in Chapter ? of my eBook A Wet Look At Climate Change, when the temperature falls, relative humidity increases. Why is that important? Because you cannot dry something like wet plaster in air with high humidity. “So”, I was speaking to Keiran the Plasterer “how long will it take for the plaster to dry so we can begin painting?” With an air of confidence that spoke experience “Sure, usually a few days, but with the bonding, could take a week” “What?” I said. Michael the Carpenter pitched in “Yeh, that amount of plaster……mmm….don’t know, could be couple of weeks or longer, it’s cold enough in here”. You know that feeling when you think you’re just getting to the end of a project or job then people and events gang up against you? One week later there did not seem to be much drying going on. To hell with this, I’m bringing our dehumidifier in. I had to run an extension lead from the house as the electrics was not connected up yet. “You don’t want to dry the plaster out too quickly” says Michael the Carpenter. “Michael, it’s b…… freezin in here. This is only a domestic dehumidifier. There’s a relationship between temperature and humidity, I wrote a book about it, it’’ll be fine” Do you sense my frustration? Feeling back in control of events now. But there was something looming in the East. Around the time Kieran the Plasterer was doing his bit, John the Builder appeared with Michael the Carpenter “We’ve been thinking”. We saw from the house, peeking out through a window, a Spade Meeting going on and wondered what the problem was now. Some background first to the conversation about to take place. Because John the Builder was on-site we asked him, just out of interest, what a conservatory would cost. We had a quote for adding a conservatory onto the house from a local windows and conservatory company and wondered how the cost would compare. “We’ve been thinking. 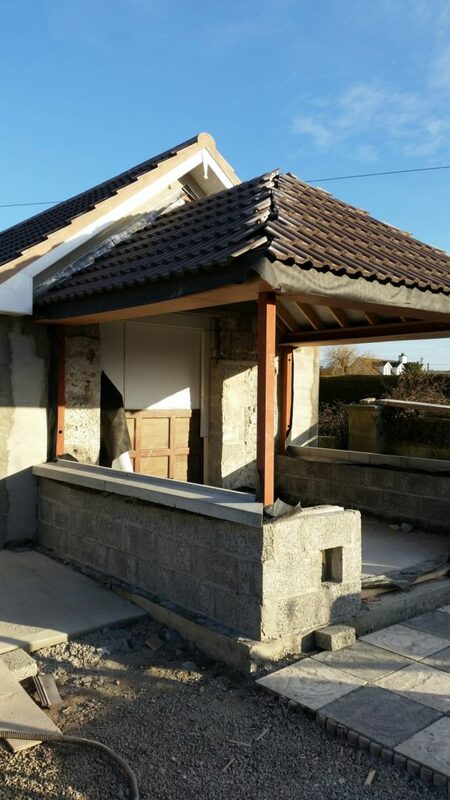 Because we have taken out the window at the back of the garage, we could drop that opening to the floor and make a door into a ‘sun lounge’ built onto your new place”. Out we all go with John the Builder and Michael the Carpenter to meet up with Eugene. “It’ll come out to here, with a wall so high” says John the Builder indicating the height with his hand. Michael the Carpenter continues “on top of the wall there’ll be windows all round to a double door which will come out this way onto your patio”. John the Builder and Michael the Carpenter now in full flow “there’s different ways for the roof”: a piece of offcut wood, commonly used by Michael the Carpenter’s version of scrap paper, is picked up from the ground and roof types are sketched. “We think a ‘hipped roof’ would be grand”. “A what?”. Michael the Carpenter look around, “see that house over there and the roof coming out the back? well like that”. “Ok lads, bottom line, how much?” Including a rough guess for the windows from Munster Joinery, it came in at under a third of the quote we got for adding a conservatory onto the house. The deal was done. Here we go again. Eugene started with his Kango, John the Builder with his pickaxe, Michael the Carpenter disappeared to order timber, roof felt and the same type of roof tiles. Apparently, after the previous roof tile delivery failure, Michael the Carpenter stood over the chap and watched while he placed the order. A couple of days later a cement mixer arrived. Not so big as in Episode 1. But this time the concrete had to be wheelbarrowed to get to where the base for the sun lounge needed to be laid. I talked about the concrete curing process and the need for high humidity in Episode 1. 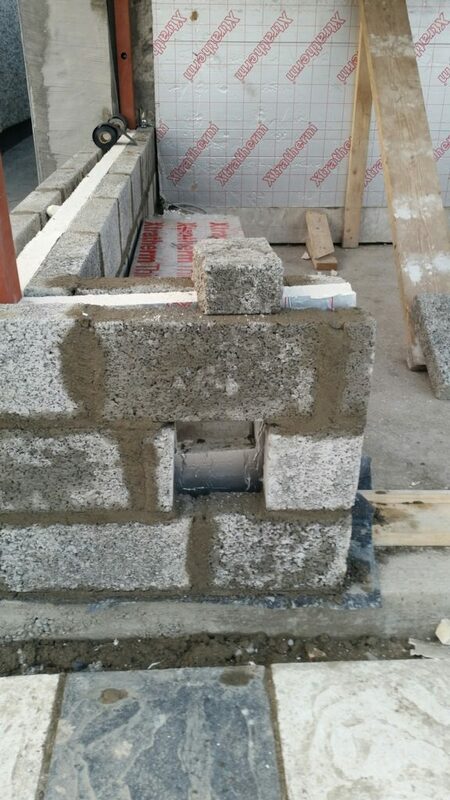 Since this concrete base was outside, John the Builder and Eugene covered it with thick polythene to keep in the moisture, and of course the Irish weather out. Steel girders arrived to be dumped in the front garden, now with less and less grass visible. These had to be man handled to the back of Relequa’s future new home. 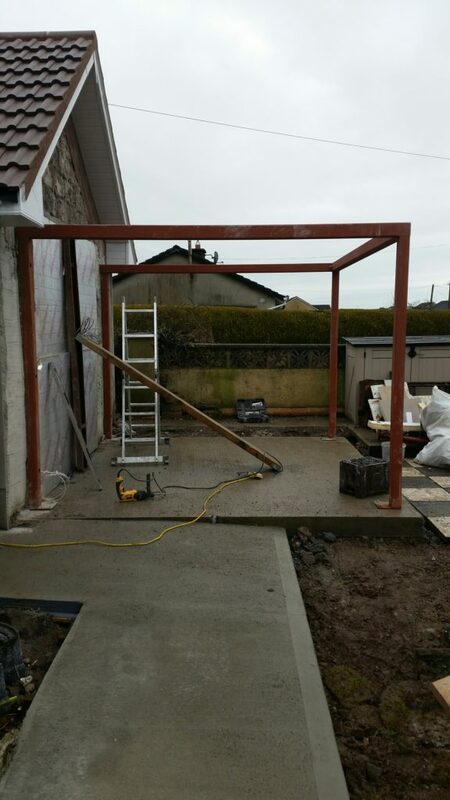 A frame was erected to support the roof. Michael the Carpenter returns and sets to work on that. Eugene the Strong, I think we’ll call him from now on: he picks up heavy breeze blocks two at time, one in each hand. “Eugene, would you do us a wee favour?” we ask. “We want a hole for a ‘Smart Cat Flap’ for Watson”. “Sure, where, what size?”. We gave him the instruction booklet from the box and off he went. It was something different. A little project that he took to heart. Eugene the Strong and Watson got on well together. He took pride in explaining to us how the tunnel of the cat-flap was going to be angled so the rain water would run out; how he would seal it to finish it off, outside and inside, when the build work was done. Next, concrete window sills arrived on a pallet that was lifted by a crane attached to the delivery lorry over the front wall. No grass left now, but that was only temporary, as they were the wrong size and were picked up again and replaced 2 days later. Fantastic! A building materials supplier actually managed to deliver the right type of tiles, the right number of tiles, AND, on time! So, Michael the Carpenter on the roof, Eugene the Strong building walls, everything hunky dory. News from the East, the Beast has arrived. 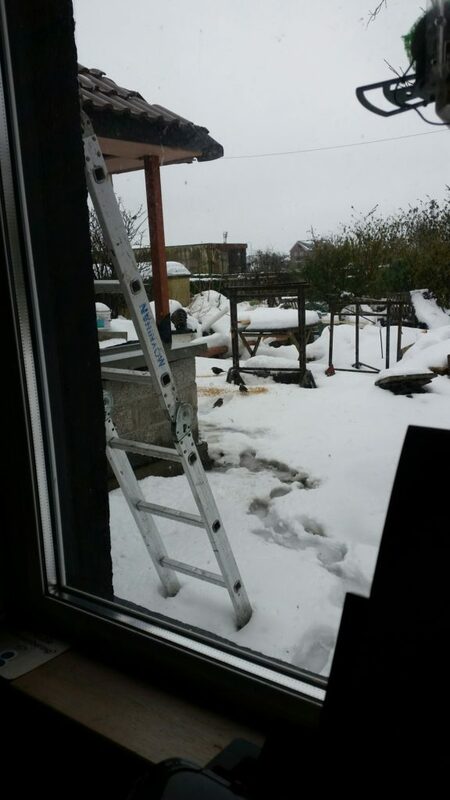 Sure enough, from beautiful blue skies to the worse snow and blizzard I have seen in the 25 years I’ve been here in Ireland. When I was writing my eBook, A Wet Look At Climate Change, I had in my mind as a running theme and a subtitle to the book, the consequences of climate change. Whatever the cause, climate change has consequences. For us in this story of Relequa’s new home, it meant no progress for well over a week and a knock-on effect for launching our new product. Coming next: Episode 4 ………. How can you leave us on such a cliff hanger!!! ?